The described semi-transparent collector is a multifunctional architectural design element. 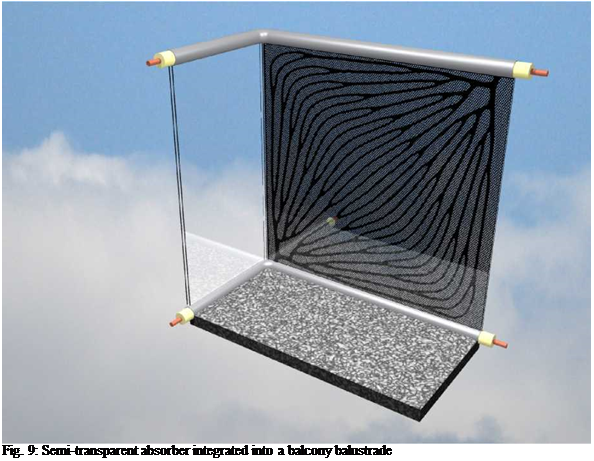 This offers a new market potential for solar thermal energy use. At a certain distance the structure of the small openings appears as a homogeneous semi-transparent area with the silhouette of the channels. This offers interesting possibilities in design: straight vertical or horizontal channel arrangements as well as curved designs such as in a FracTherm® absorber  can be realized if roll-bonding or another production method with similar flexibility is used. The reflectivity of walls, ground and ceiling are respectively 0.75, 0.45 and 0.75.
 . In this study, the value of acceptable illuminance level has been set to 300 lux. To quantify the mean daylight autonomy in the room, the room has been divided into three equal strips (see Figure 3). The illuminance level is supposed to be the worst in the middle strip. For this reason, we will focus on this specific zone. This section presents some preliminary results of the study to determine a combination between the solar shading and daylighting in buildings. significantly too. It is especially during winter’s month. During winter the heat island effect results in minor energy consumption and, in consequence decreases the emissions generation. This could be thought as a beneficial effect, but it is important remember, that associated with this phenomena there are other environmental problems, as it was explained in the introduction. In previous research on energy efficiency in buildings has found that it is possible to achieve comfort conditions, for the Mediterranean climate, without the need for mechanical energy for heating and cooling in houses, through the use of compact shape and the optimization of insulation, internal mass and fenestration design. However, it became clear in the work that a more sophisticated analysis of buildings and user behaviour was necessary and this forms the concern of this paper. 65.7 kWh in October and the minimum was in 39.7 kWh in February. Fig. 6. 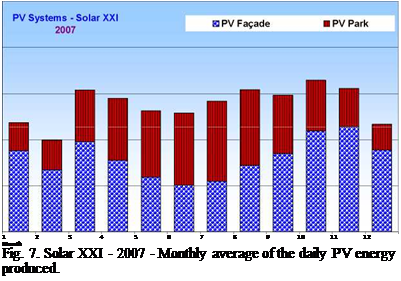 Solar XXI – 2006 – Monthly average of the daily PV energy produced. 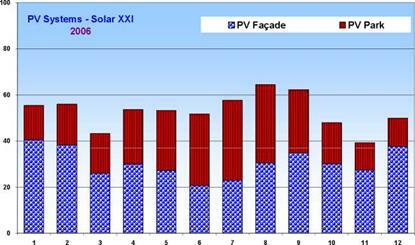 The yearly total energy produced by the PV systems, is depicted in Table 5 and Table 6, varying from 19.4 MWh in 2006 to 20.2 MWh in 2007. Solar availability is quite high in Portugal, even during the heating season. This makes the direct capture of solar radiation (windows), the indirect collection for domestic hot water and space heating (thermal solar system) and eventually energy production (photovoltaics) advised. Large windows are mainly oriented south, increasing the useful solar gain during winter. Smaller areas are oriented east and west and minimal areas to north. Overhangs on south windows and exterior venetian blinds on all provide solar protection during summer.